If you want to place a banner on Putty&Paint to advertise your product, shop or company feel free to contact us to get a quote on fees and media statistics (visitors, page impresseion, locales etc) at info [ at ] puttyandpaint [ dot ] com. We have two banner positions, top and bottom, each with 3 available slots. 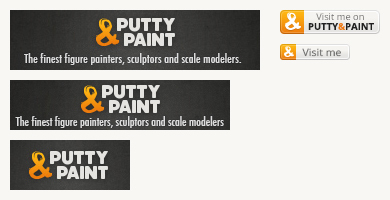 If you want to support Putty&Paint or just show off your are part of it, you can place a banner on your blog, website or forum and link to www.puttyandpaint.com or your profile. Below you will find some banners, logos and some smaller badges you can use. Please do not alter them or modify the logo.